Hi! 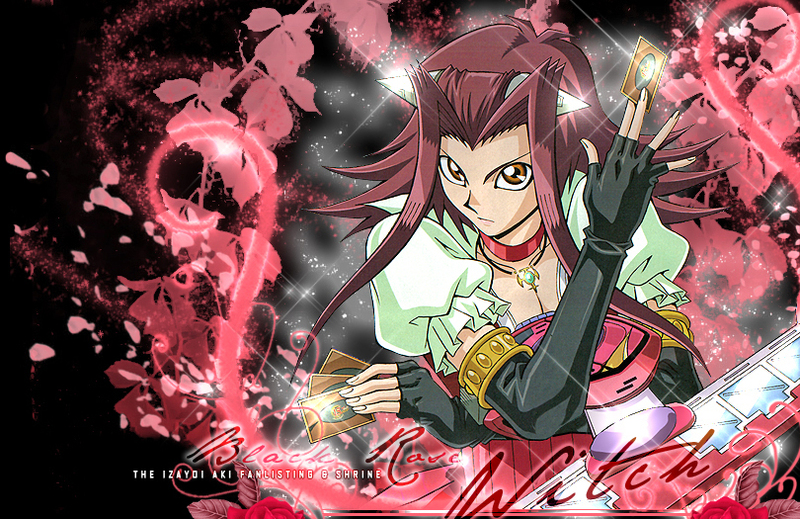 Welcome to Black Rose WITCH, a shrine and the TAFL approved fanlisting for Izayoi Aki (also known as Akiza in the American dub), the heroine of the anime and Card Game Yu-Gi-Oh! 5D'S ! Aki is absolutely my favorite character of Yu-Gi-Oh! 5D'S!! She's different than the canonic heroines of Yu-Gi-Oh!, her personality is mysterious and rich of facets, so I'm very, very, VERY happy and proud to own her fanlisting! And a special thanks to Cindy for the used scans! Please, choose a link from above to fully access the site, and if you're Aki's fan, feel free to join her fandom! Fanlisting last updated on April 6, 2019 . We have a total of: 173 members ! Update of May 31th, 2011: The related to Aki's Deck is complete. Thank you so much to the great Zack for the informations!! Update of November 29th, 2009: Aki has 100 members! Thank you!! Update of March 5th, 2009: 50 members, WOW!! Thank you very much!! Update of November 28th, 2009: 25 members! Thank you!! Update of November 2nd, 2008: 4 new codes added, thanks to C.C.! YU-GI-OH! 5D'S is property of Takahashi Kazuki, Toei Animation, Shueisha and Konami, all rights reserved. This is a fan- site, I don't intende violate them. Layout and contents are @Dorothy, do not reproduce without permission.